These entries are about how I do what I do. 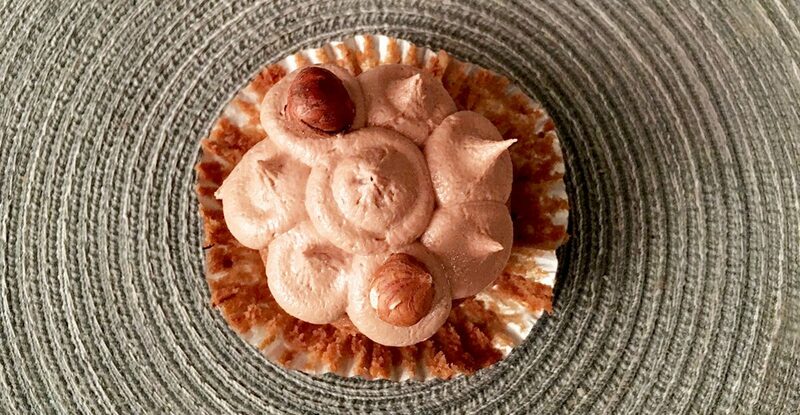 For my husband’s birthday treat, I baked cupcakes using hazelnuts and Rigoni di Asiago‘s Nocciolata, an Italian hazelnut-cocoa spread. I could eat this stuff by the spoonful, but I restrained myself and saved it for baking! I ground hazelnuts in our small food processor and combined them with the other dry ingredients. 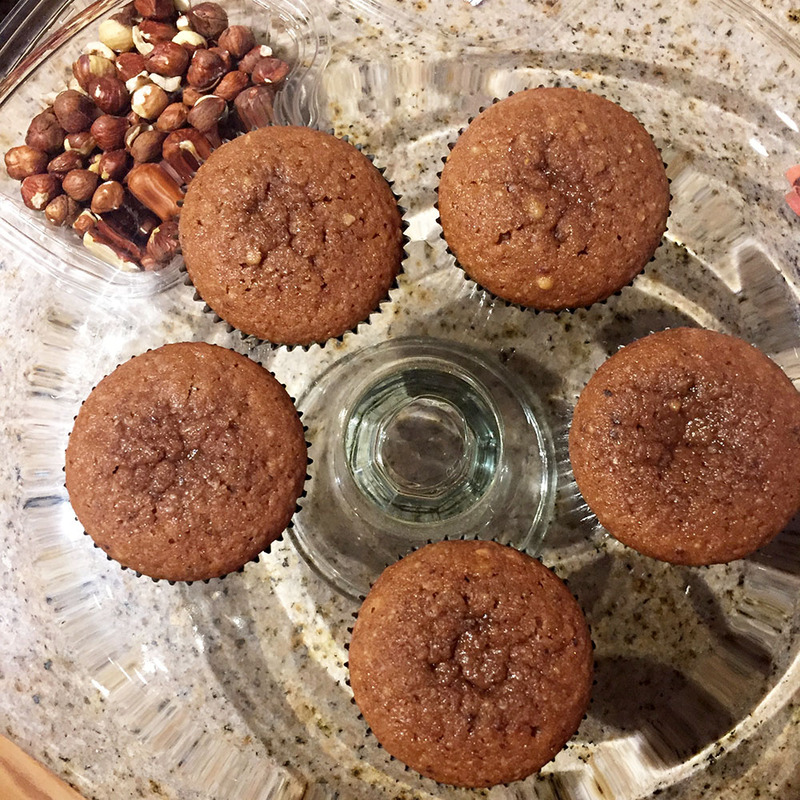 I ground them rather fine with some slightly larger bits, but you could vary depending on how “nutty” you wanted your cake. Thank you to Rigoni di Asiago for providng me a sample of Nocciolata! The Italian company offers products exclusively from sustainable, organic farming. In addition to the hazelnut spread, they produce honey, fruit spreads, and a sweetener derived from apples. Learn more at www.rigonidiasiago.com. Preheat oven to 350 degrees F. Line muffin tin with paper cupcake liners. Cream the butter and sugar at medium speed, then reduce to low. Add the eggs one at a time, then add the vanilla extract. Sift together the flour, baking powder, and salt. 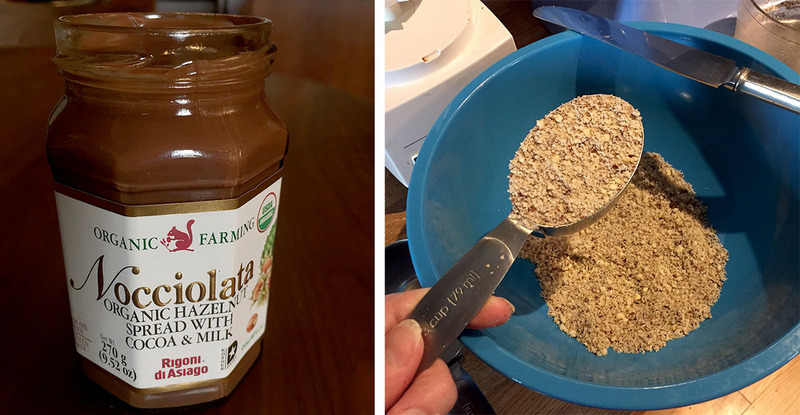 Mix together with ground hazelnuts. While mixing on low, add 1/3 of the flour mixture to the bowl, then the milk, then another 1/3. Add the Nocciolata before the rest of the dry ingredients. 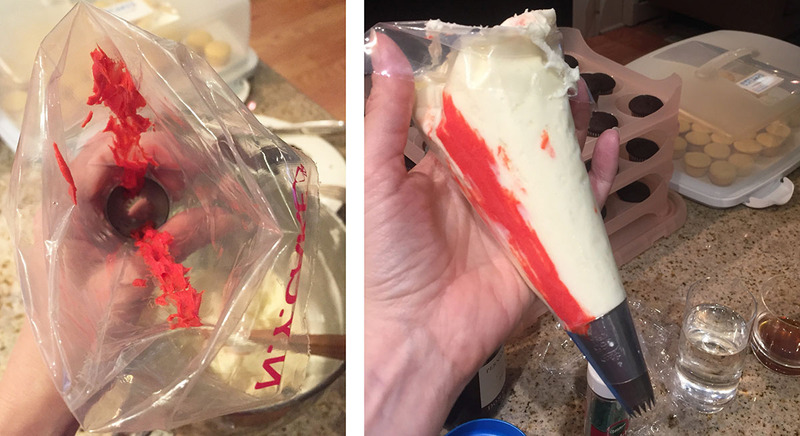 Scoop batter into lined muffin tins with an ice cream scoop. Bake about 18 minutes, rotating pans halfway through. 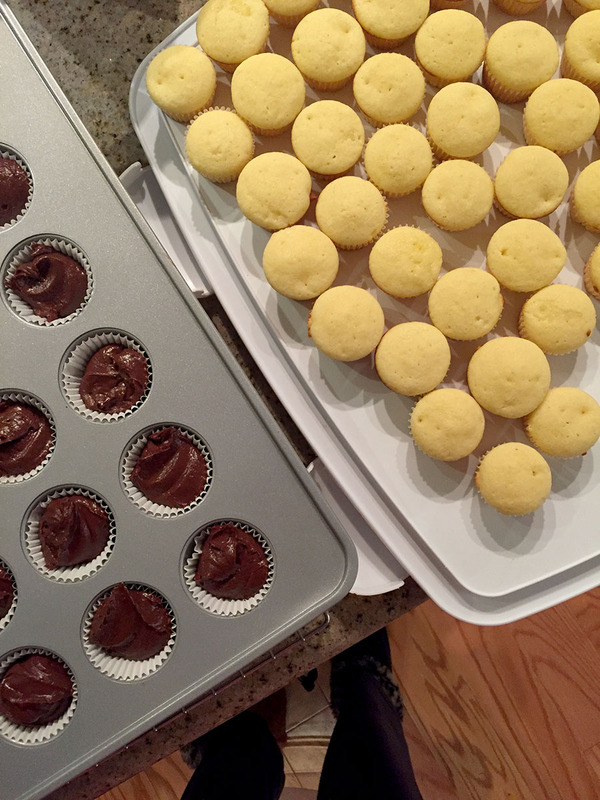 For frosting: Beat the butter and Nocciolata until smooth and add the vanilla extract. Slowly add the powdered sugar, then the milk. Add a little more milk if frosting is too thick or not smooth. 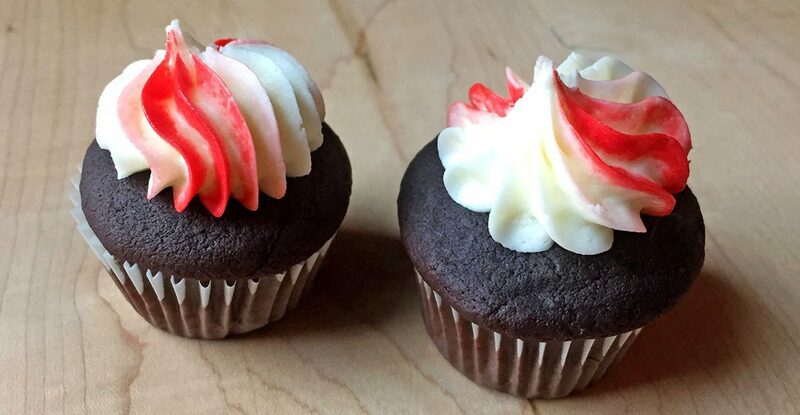 Add more powdered sugar if the frosting is too runny. 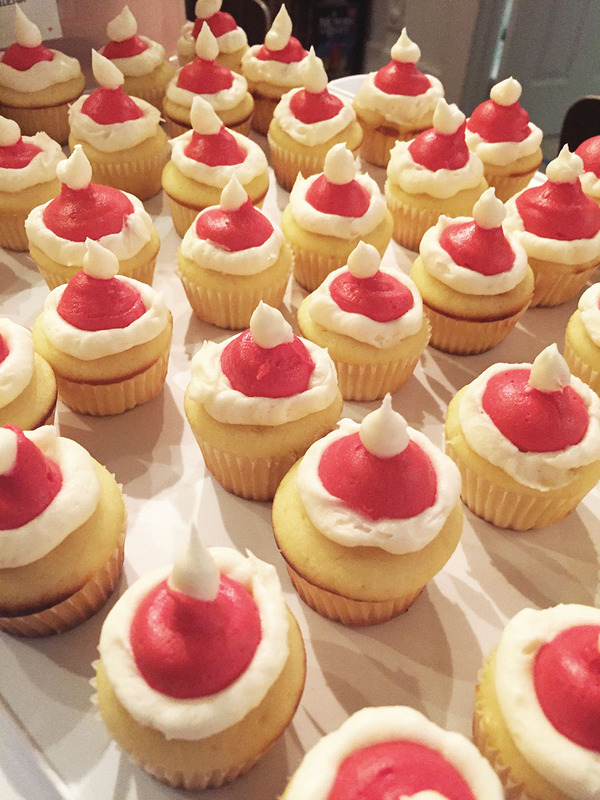 Frost the cupcakes once they reach room temperature. 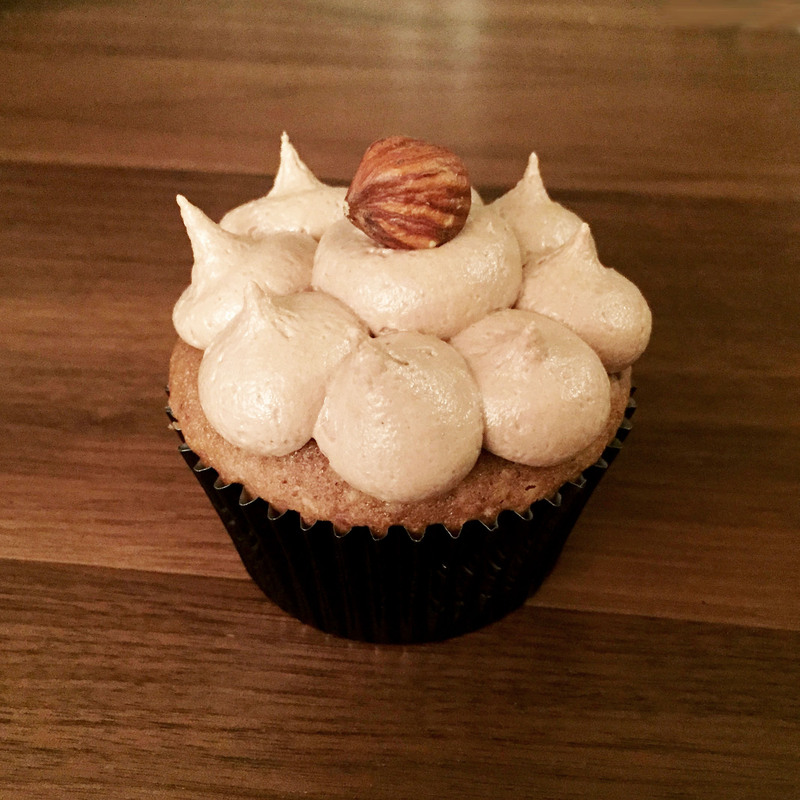 Top with a whole hazelnut, if you so desire! It is fall here in New York, and the delicious, fresh-off-the-tree apples are to be had in abundance. I don’t want any to go to waste, so it was apple pie time! 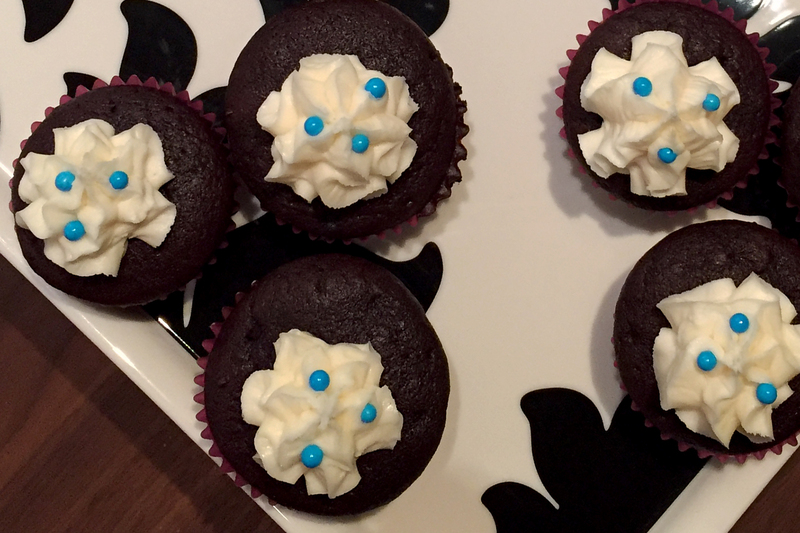 Of course, I had to try baking some in cupcake tins. Baking what I blog, I followed my instructions for making and freezing apple pie filling. 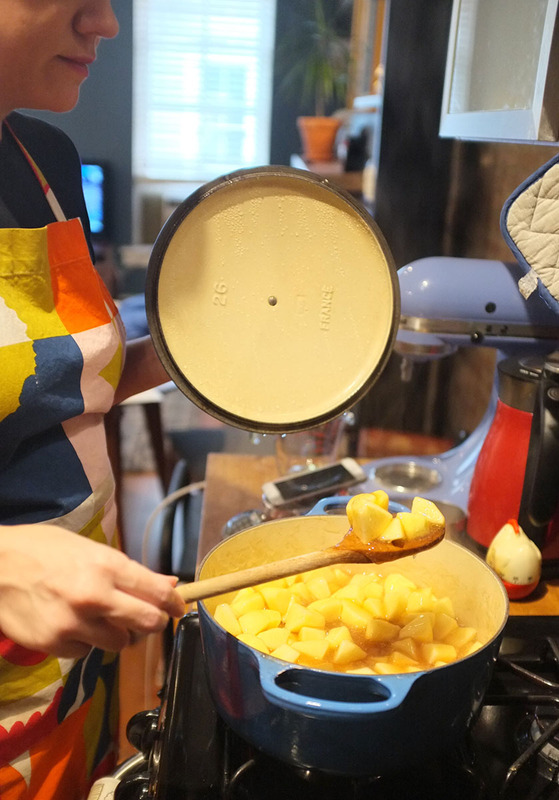 I used 7 apples, which were 2 1/2 pounds once peeled and cut. Juice from a Limoneira lemon along with cinnamon and nutmeg flavored the filling. 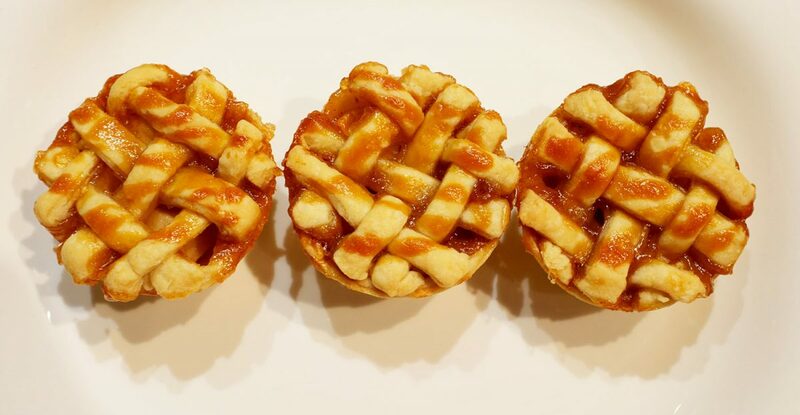 I needed only about 1/3 of it to make 12 mini apple pies, so I froze the rest for a future pie. I cut the apples in chunks rather than slices to better fit the muffin tins, and I perhaps could have cut smaller, though I did not want it to turn into applesauce. I could only get about 4 pieces of apple in each. It was enough, though I felt there were some gaps in a few pies (gasp!). I’ve had good results with Simply Recipes‘ all-butter crust recipe, though I use a stand mixer with a flat beater instead of a food processor. My method: After mixing together the flour, sugar and salt, I stop the mixer to add the butter, tossing with a fork to coat before mixing on medium-low speed until it resembles coarse cornmeal. I then add ice water a tablespoon at a time until the dough starts to pulls together. I cut out 4-inch rounds to place in the bottom of greased muffin tins. 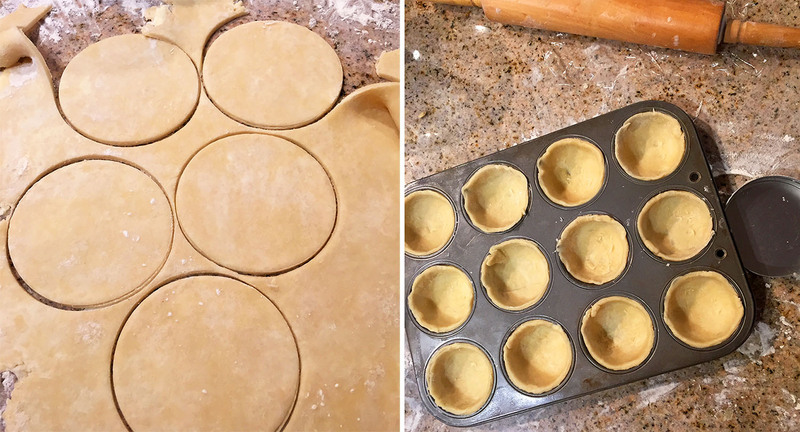 After filling the cups, I cut pieces of pastry dough and wove a lattice with six strips for each. It took awhile, but the results were pretty cute! I could have gone larger for the bottom crusts, I didn’t have a rim to fold back over for a better edge. It worked out ok, I just tucked each strip under, trying to connect to dough below. 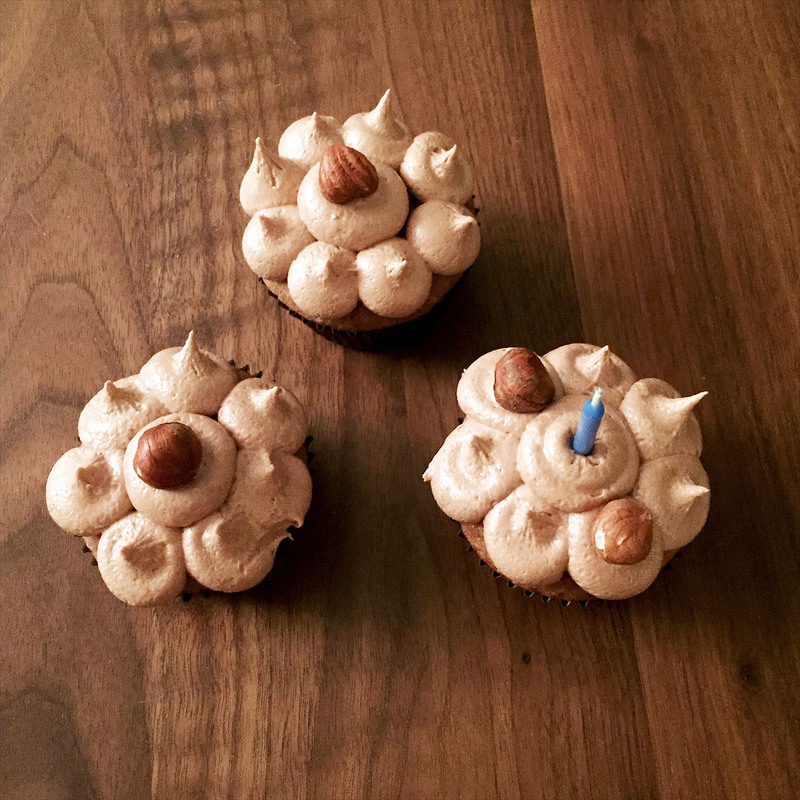 To get in just a bit more deliciousness, I used Sonoma Syrup Co.‘s Sea Salt Caramel Syrup to add a finishing touch. 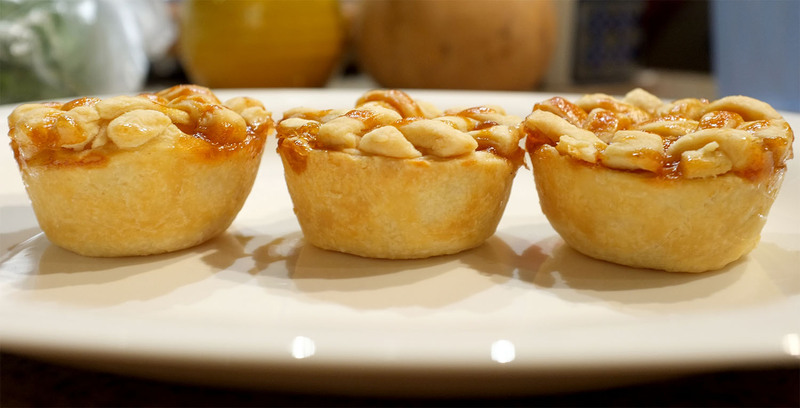 I put the caramel in a squeeze bottle for more control and drizzled some over the uncooked pies before putting them into the oven. 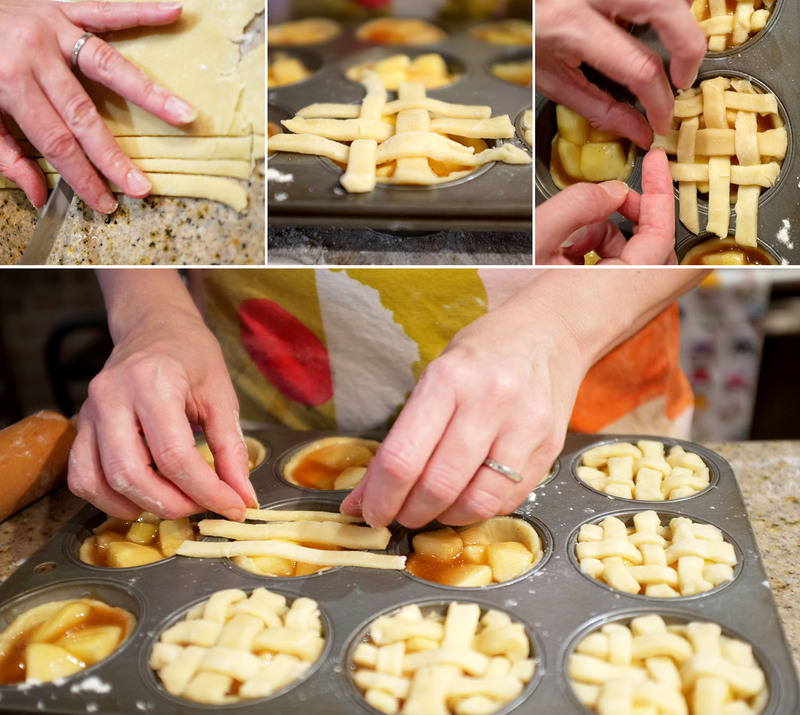 When researching caramel apple pie recipes, I’d read one that poured caramel over the lattice, which is all I did here. A taste of just the top crust was delightfully caramel, but overall I’d say that I did not use enough. If you try the same, you should really pour that stuff on! It got messy in the oven, but once the pies had cooled somewhat and come out of the pans, I was delighted with the results. 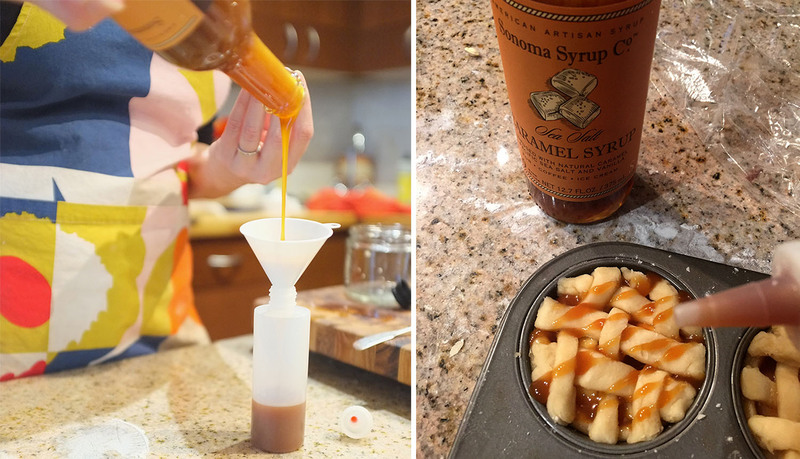 Thank you to Sonoma Syrup Co. for the caramel syrup. The company handcrafts its extracts, syrups, and bar mixers in small batches in Northern California with botanical ingredients. Learn more at www.sonomasyrup.com. Watermelon says summer to me. 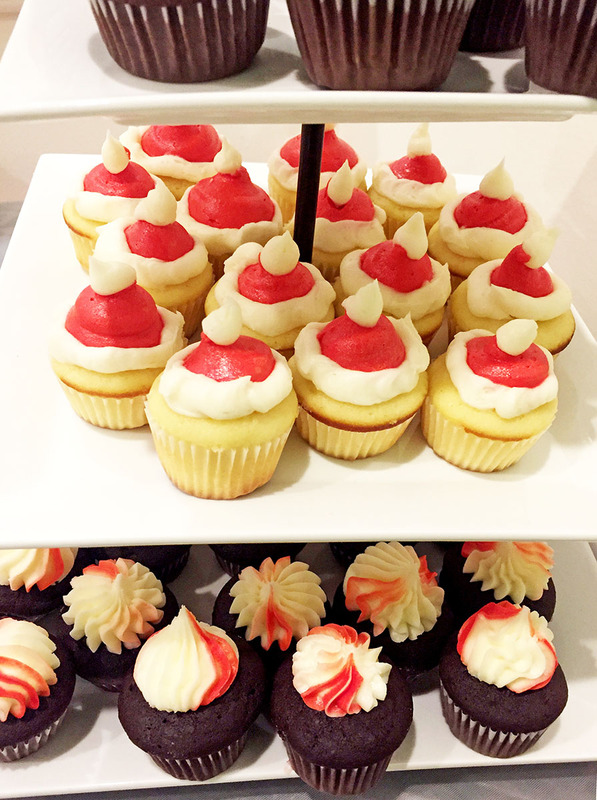 A last minute request for watermelon-flavored cupcakes meant I didn’t have much time to research or shop. Fresh watermelon seemed risky, and I could not find extract, so I used what I could find in a hurry. Jelly Belly Watermelon Syrup–I bought my bottle at Michael’s—is meant for making snow cones and popsicles, but I gave it a try in my cake batter and frosting. I reduced it to make it more concentrated, but it gave only a faint flavor. 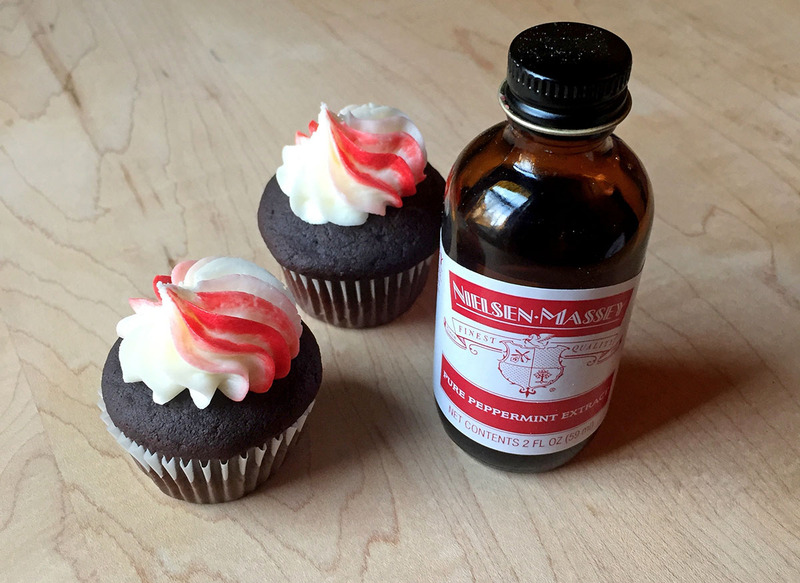 I would recommend using Pure Watermelon Extract for those wanting to bake better watermelon cupcakes than I produced! 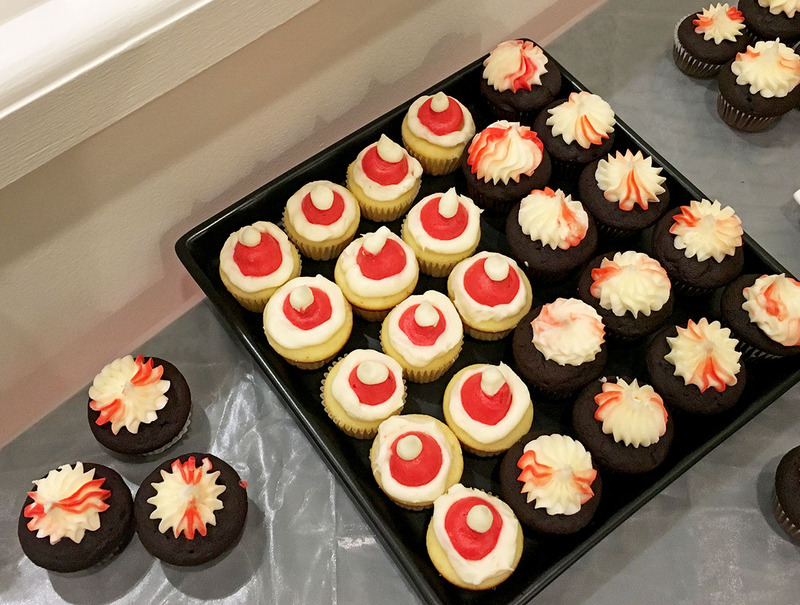 The cupcakes were still good, but they mostly just tasted like vanilla. At least they looked pretty. 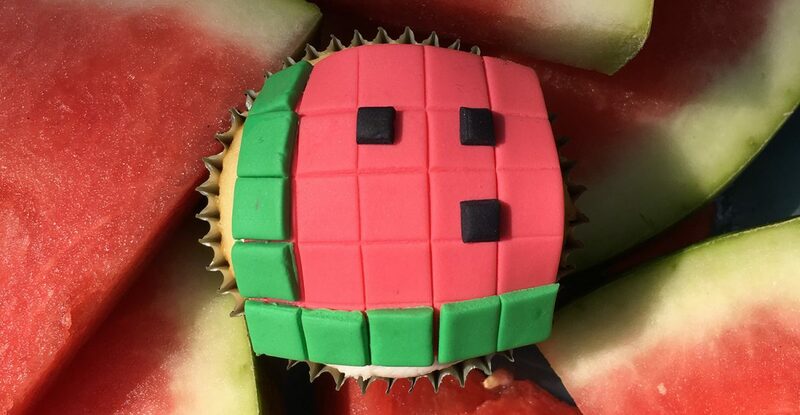 I was making Minecraft cupcake toppers with gum paste (stay tuned for Minecraft Cupcakes, Round 2! 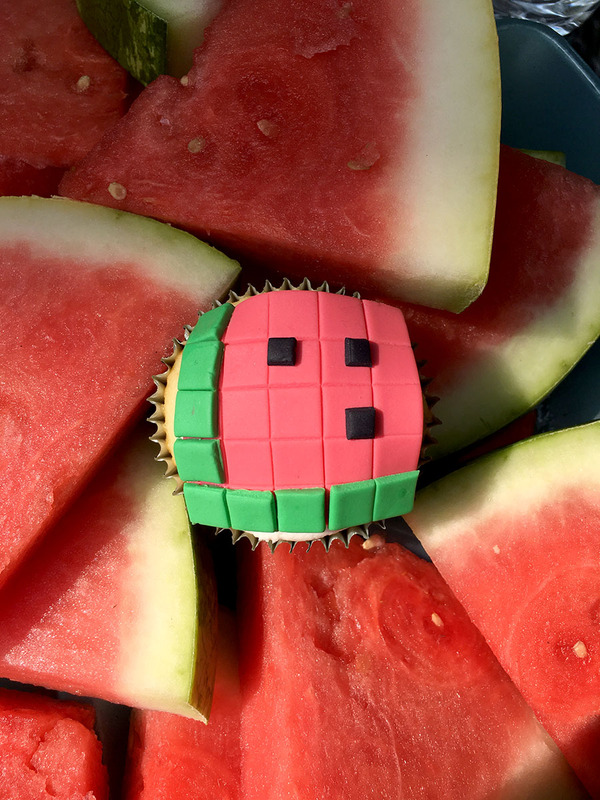 ), so I created some watermelons while I was at it. The Jelly Belly Watermelon Syrup did make a kid-pleasing soda when added to seltzer (approved by a 7-year-old expert). We are finally somewhat settled in our new place and ready for guests! 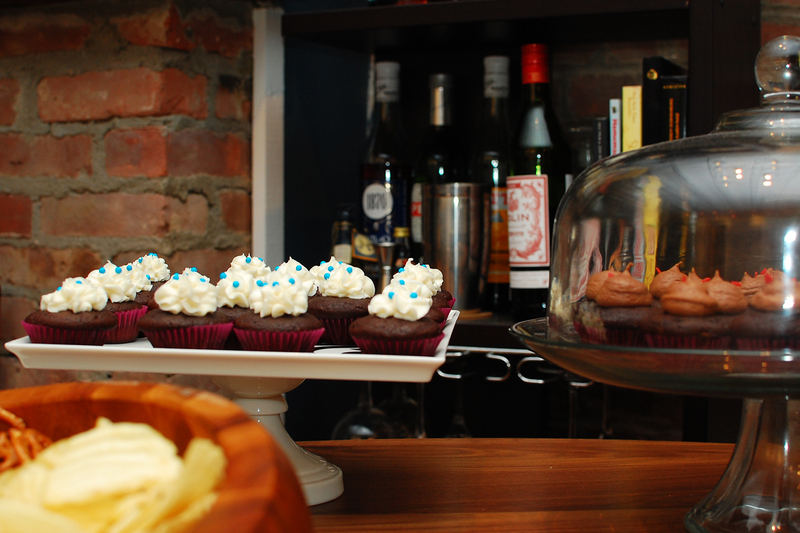 For our housewarming/birthday pre-party, I baked mini chocolate cupcakes. 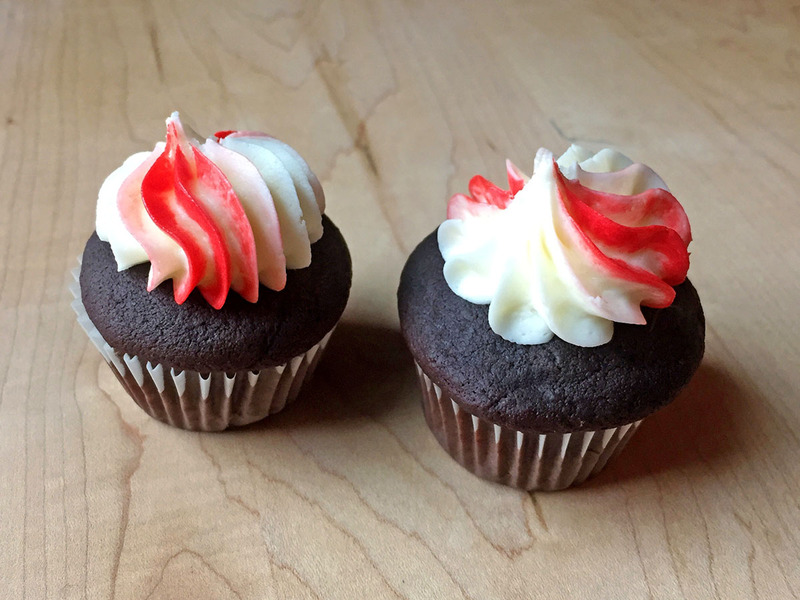 Some got vanilla icing, the others got spicy chocolate. 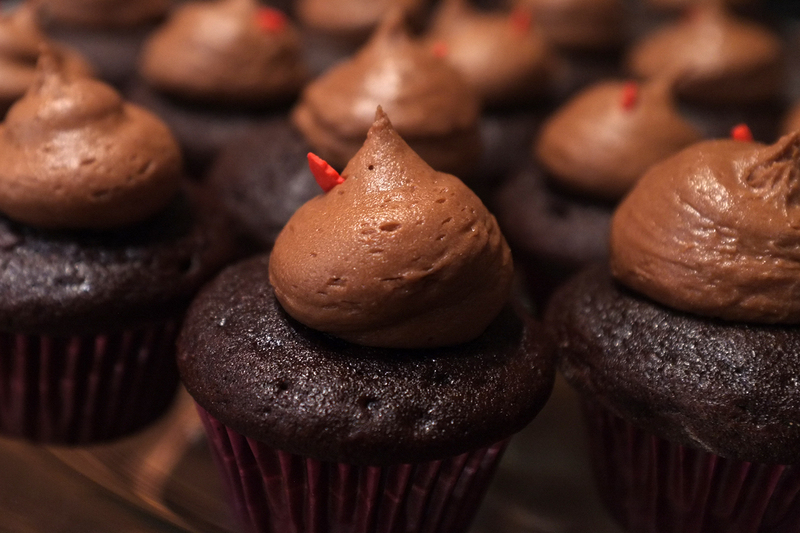 I’d intended to roast a habanero and make my Habanero Chocolate Icing, but I could not find any hot peppers at the grocery near our new apartment. Without time to search, I did my best with what I had at home. I went for the hot sauce. I used Brooklyn Grange’s Rooftop Hot Sauce, which I got as part of With Love from Brooklyn‘s “Brooklyn Heat” selection. Yum. I didn’t want to go too crazy. I have a higher spice tolerance that some, so I held myself back. 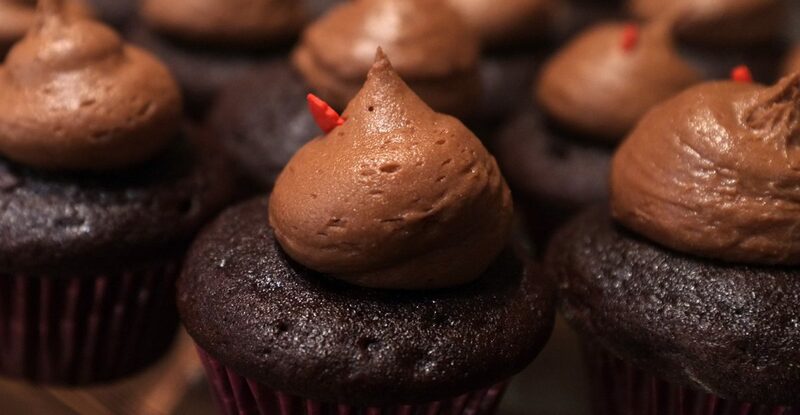 I used about 2 tablespoons in a half batch of chocolate icing. They only had a hint of spice, an afterburn. Guests said I could have added more, so now I know. 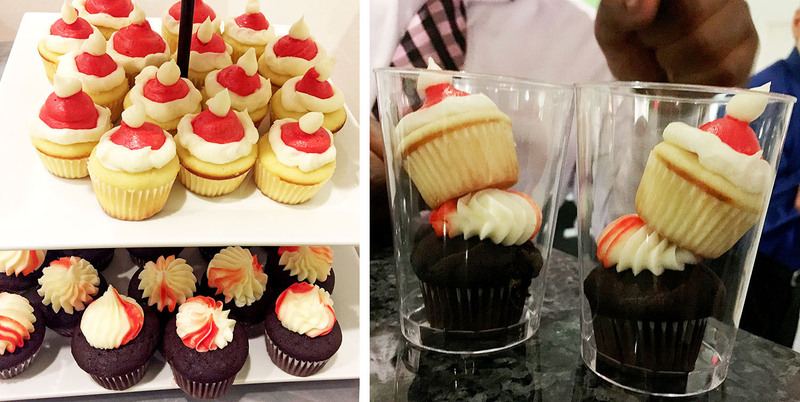 If the cake had also had spice, it might have been a different story! 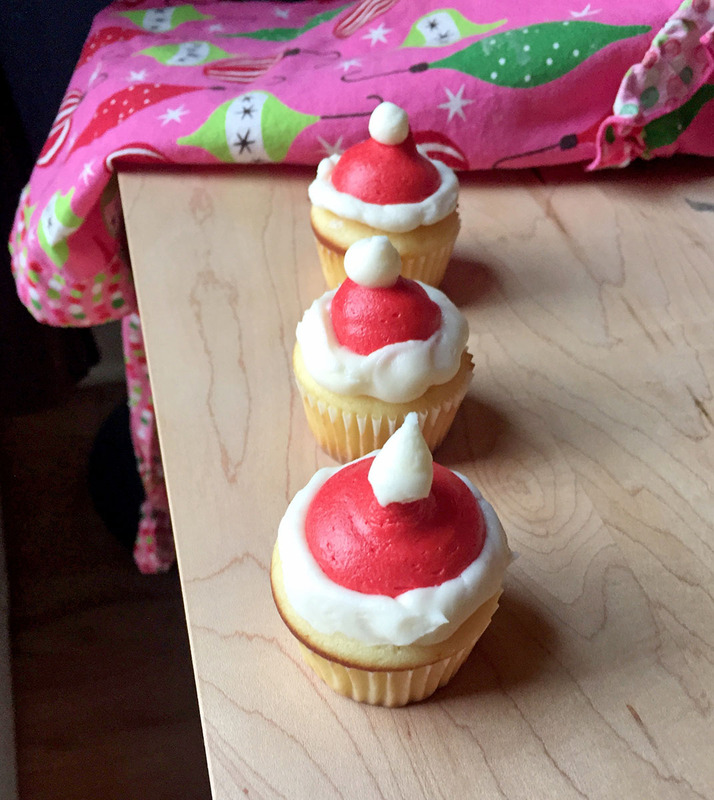 I did the vanilla frosting for any wee guests—I know children mostly just lick off the icing—or anyone else who wasn’t into spicy.